LifeSpan is well known for its ability to effectively advocate on behalf of quality senior care organizations across the spectrum of care. One tool that LifeSpan effectively utilizes in advocating for its members is a political action committee, or PAC, which is a type of organization that pools campaign contributions from members and donates those funds to campaign for or against candidates, ballot initiatives, or legislation. 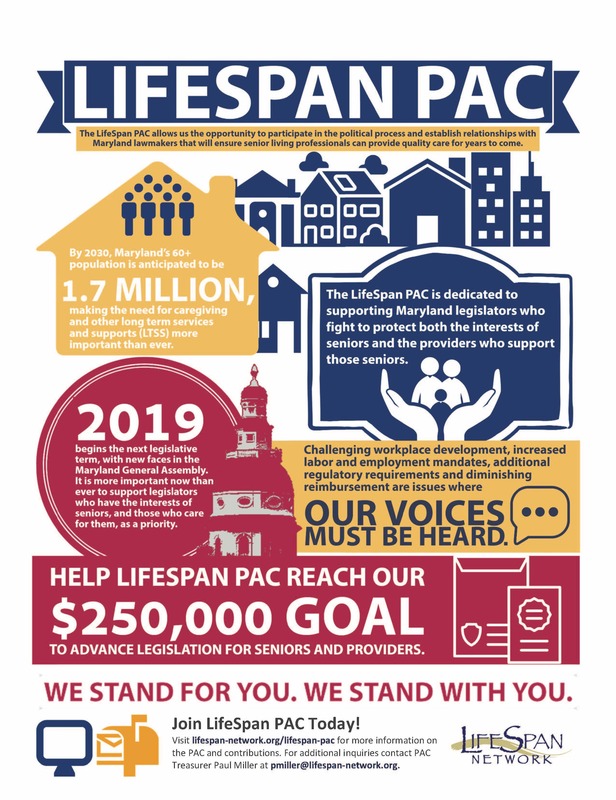 The LifeSpan PAC is dedicated to supporting Maryland legislators who fight to protect both the interests of seniors and the providers who support those seniors. 2018 is an election year in Maryland and could result in the turnover of many of our current elected officials in Annapolis. It is more important now than ever to support legislators who have the interests of seniors, and those who care for them, as a priority. A person may contribute directly or indirectly no more than $6,000 to one political committee during the election cycle. 2018 Election Cycle - 1/1/2015 through 12/31/2018. Exception: A person my make cash contributions in the aggregate up to $100.00 in an election cycle. A person may not make a monetary contribution in excess of $100.00 except by check, credit card, or electronic method approved by the State board. Anonymous contributions are strictly prohibited. The cost of a raffle ticket may not exceed $5.00 and an individual may not purchase more than $50.00 worth of tickets (only individuals may purchase raffle tickets). If an individual makes aggregate contributions of $500.00 or more to a political committee, the individual must provide employer and occupation information to the political committee for disclosure on the campaign finance report. Contributions made by business entities are subject to the $6,000 contributions limit. OR, one of the business entities wholly owns the other.